Is your customer planning a new bathroom or a bathroom modernisation, and wanting to be updated on bathroom technology and trends? All you need to do is arrange a personal product consultancy appointment with him at our exhibition: our consultants will take the time to answer any queries that you have about Hansgrohe and Axor products, explain functions to you and show you appropriate product combinations. Your customer will form a more accurate idea of what they want for their bathroom: really benefiting from this information and the practical examples will give them ideas for your joint bathroom planning project. 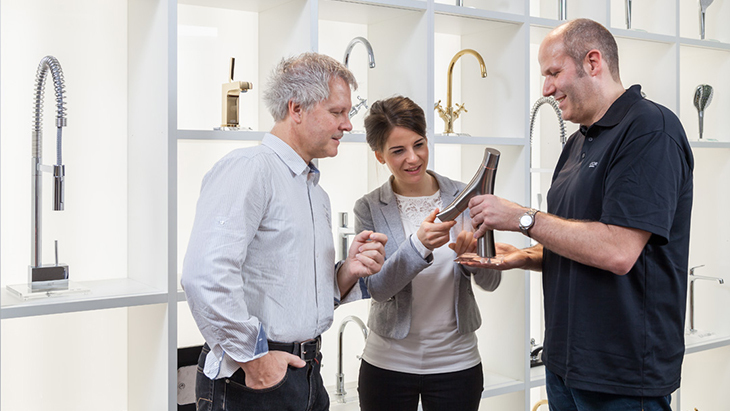 Whether you attend the consultation appointment together, or whether your customer comes to the Hansgrohe Aquademie with a pre-existing bathroom design: the consultancy service is, of course, free of charge. Ideally, you could also suggest that your customer gets some first-hand experience in our Showerworld when they come for the consultancy appointment: both appointments complement each other perfectly. Consultation takes place every Tuesday, Wednesday and Friday between 1.00 pm and 6.00 pm. Please arrange a personal appointment a week before your planned visit. We look forward to receiving your reservation.